Seniors in the UAE are becoming more aware that some form of exercise and daily activities can have a dramatic improvement on their everyday lives. Getting older doesn’t mean we need to stop exercising, in fact it’s just as important for seniors and the elderly to get moving. Even though someone in their 80’s might not be able to lift as many weights as they used to or maintain washboard abs there are still so many fitness and sporting activities in Abu Dhabi, Dubai and Sharjah which are designed for (or suitable for) seniors and the elderly. In our senior years our bodies change – that’s inevitable. For most of us though we can do small things everyday to help us remain mobile, flexible and in good shape. Read on to find out more about exercise types and even personal training that are great fitness options for older men and women in Dubai, Abu Dhabi and Sharjah. 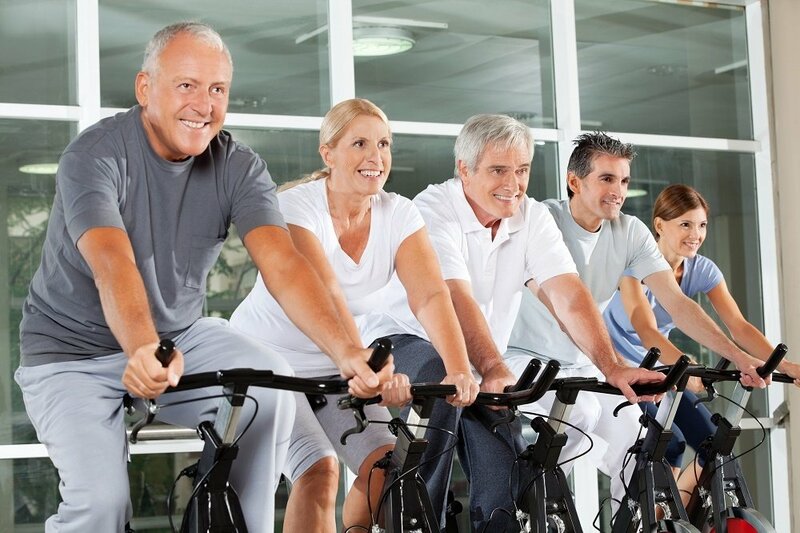 Dubai and Abu Dhabi offer plenty of options for personal fitness for seniors and also for group fitness in the UAE too. Whether you want to just become more active or have a physical condition such as age related arthritis you’re bound to find an fitness or sports activity to suit your needs. Personal trainers for senior fitness in Dubai and Abu Dhabi are also available. Specialist trainers listen to your needs and create personalised at home workout plans design around your lifestyle. I think there is a bit of a stigma surrounding seniors training in Dubai, or they adapt the mindset of it is too late to start and they are too old to train. This is very far from the truth. If any seniors are reading this I want them to know it is never too late to start training and better yourself and your health. 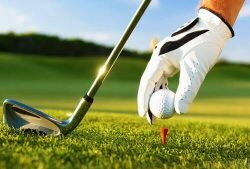 Golf For Seniors In The UAE – There are plenty of golf courses in the UAE that have pay per play or full membership options. Golf is a great way for seniors to keep active through walking, bending and maintaining flexibility in the joints. Golf is a low-impact exercise method which doesnt place too much stress on the joints or muscles but will help you move more freely. Golf for seniors in the UAE is also good for the social aspect of the sport and can be played in groups. Swimming For Elderly Fitness In The UAE – One of the best all-round exercises you can do is swimming. It’s particularly good for seniors in Abu Dhabi and Dubai because unlke some other sports and training methods swimming is no-impact. No-impact exercises are ideal for seniors with pre-existing medical conditions like arthritis and other muscle/joint conditions because it places no stress on the joints. 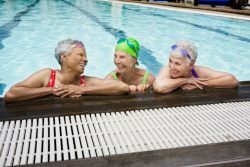 Swimming for seniors is great for body toning and adds an element of cardio workout too. Swimming can be done on a one to one basis with a swimming personal trainer for seniors in the UAE or you could join a swimming class which is designed for seniors/elderly. Swimming classes are great for the social aspect too – maybe even meet some new, like-minded friends. Yoga For Seniors In Dubai, Abu Dhabi & Sharjah – In one form or another (and there are many forms of yoga!) Yoga is great for people of all ages. You’re never too old to start Yoga and while seniors in the UAE may initially have some problems with advanced yoga poses basic moves are a great way to stay supple. Regular Yoga sessions give a lift to both the body and mind and you’ll be amazed at how Yoga can work wonders for your flexibility and body tone. If you are interested in Yoga for seniors it is better to either attend a Yoga class in the UAE or start with a personal trainer. That way you can be sure that you are practising the basic moves of Yoga correctly – yoga is about correct form to ensure you get the most out of each yoga pose and reduce injury. Any exercise comes with precautions so please make sure that as a senior you always check with your medical practitioner before starting any exercise plan. There are plenty of other ways to stay fit and healthy for seniors in the UAE and the UAE Personal Trainers Website aims to bring you the best information. We regularly add new and informative information so check back often. Keep active, stay fit and remain healthy! Looking for a senior fitness personal trainer in Dubai, Abu Dhabi or Sharjah? Click the link below for further information on professional male and female trainers in your area.